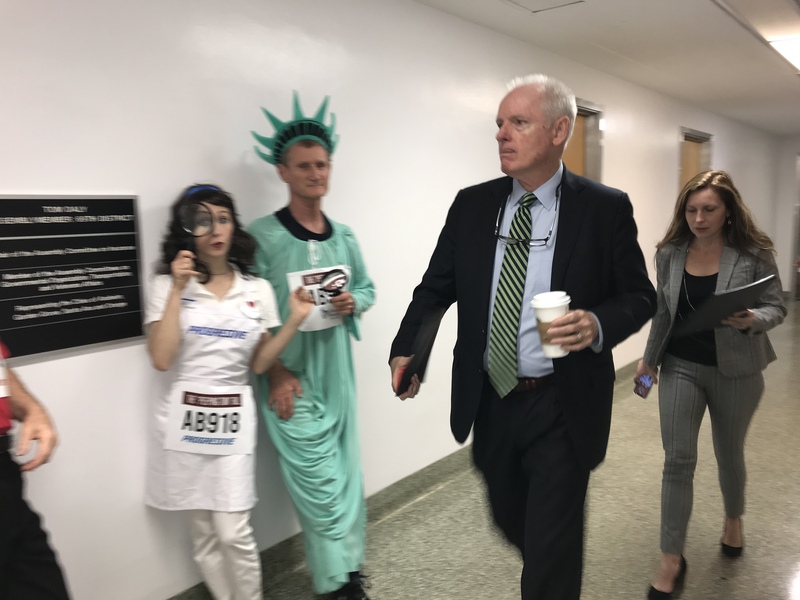 A troupe of mimes dressed as insurance company mascots tracked lawmakers and lobbyists outside the hearing room to dramatize how the bill, sponsored by Committee Chair Tom Daly, would allow insurers to violate their policyholders' privacy. "Assemblymembers will have to answer their constituents about why they voted to strip their privacy rights after taking a combined $1.1 million in campaign contributions from the insurance industry,” said Carmen Balber, executive director of Consumer Watchdog. Consumer Watchdog will alert the constituents of every Insurance Committee member via email and robo-calls about their vote and how much money they received from the insurance industry. Consumer Watchdog is working in partnership with the Neighborhood Assistance Corporation of America (NACA), together the groups have more than 600,000 Californians as members and subscribers. Assemblymember Daly has received more than $183,000 in campaign contributions from insurance companies. Members of the Assembly Insurance Committee have received more than $1.1 million from the insurance industry. The California Consumer Privacy Act takes effect in January and empowers consumers to prevent their personal information from being sold to other companies, gives consumers the right to see and delete the data companies collect about them, and allows consumers to sue reckless companies for data breaches.